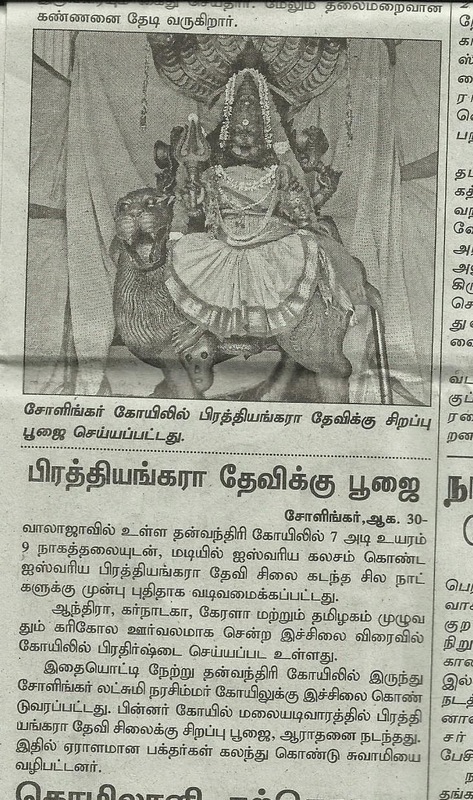 A six-foot high, Aishwarya Maha Prathyangara Devi idol is being taken round in Karikolam throughout Tamil Nadu from August 29, 2014, before returning to Sri Danvantri Arogya Peedam, Walajapet, for its installation shortly. 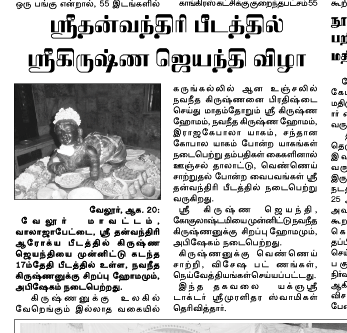 Peedam founder Kayilai Gnanaguru Dr Sri Muralidhara Swamigal has announced that the Karikolam would be undertaken throughout South India in the interest of world peace, and to pray for rains to provide relief to farmers, and prevent ills and troubles for the people of the world. At the end of the Karikolam, the idol would be installed at the Sakthi maha peedam being established next to the Danvantri Peedam at Walajapet. 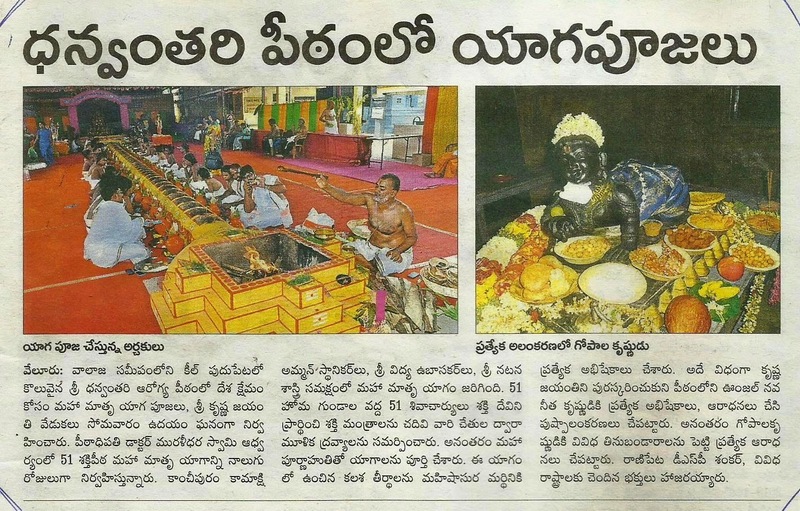 Recently, over 6,000 kg of red chilly ‘vethal’ were used in a 12 x 21 feet special homa kundam for a Prathyangara Devi homam conducted for a week. 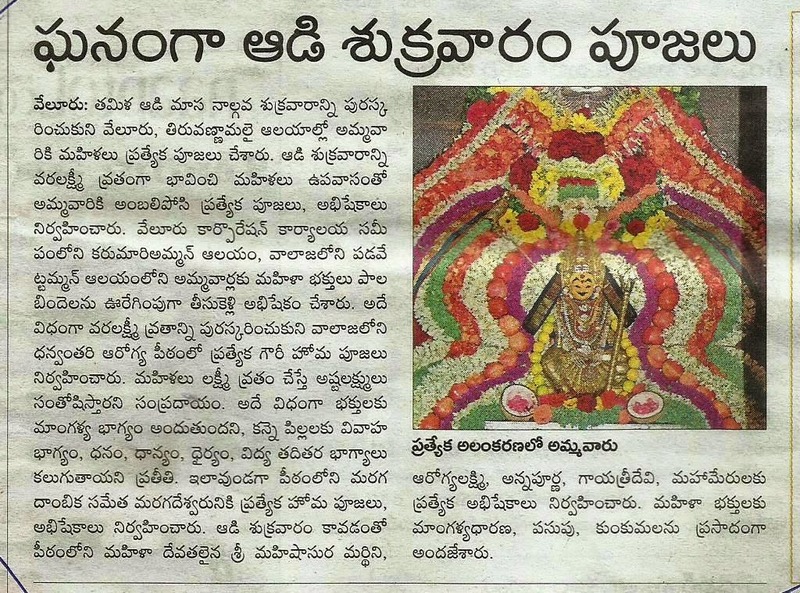 Over 1.5 lakh devotees participated in this yaagam. Sri Muralidhara Swamigal then received a message that a Prathyangara Devi idol should be installed at the site of the yaagam with Ardha Meru, and that it should be known as Maha Peedam. suggested that a yaagam should be performed at Her Jwalamukhi shrine in Himachal Pradesh. Thus, Swamigal performed the yaagam at over 30 Sakthi and Siddhar peedams. 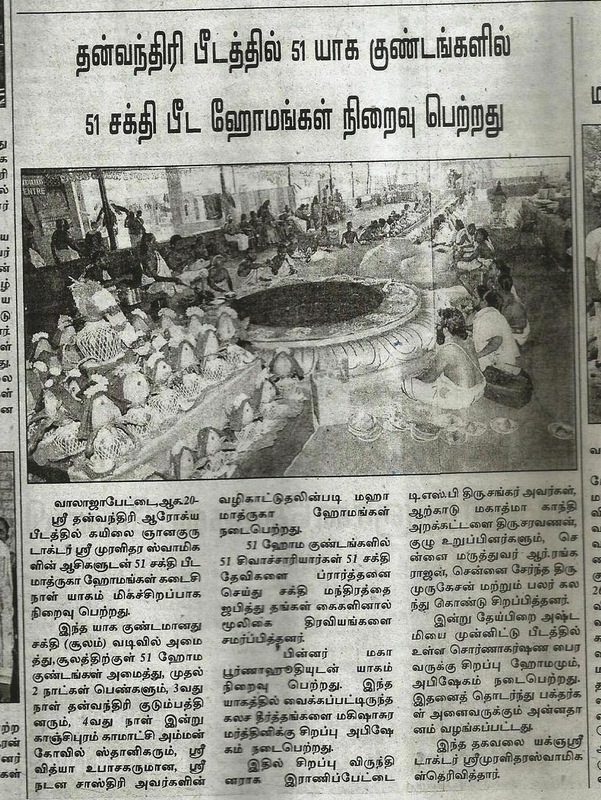 Water, stones, sand and herbs collected from these peedams were brought to the Walajapet site, and a Trisoolam was established wherein 51 yaaga kundams have been created for 51 Sakthi Peedam yaagams to be conducted from August 14 and 17 at the end of which the Karikolam would begin. The idol would be installed shortly, after the completion of the Karikolam. Swamigal has said devotees who wish to perform pooja at their houses or offices, with the Prathyangara Devi idol, can register with the Peedam and make bookings for the same. Those who wish to conduct Danvantri homam in the presence of Danvantri utsavar, Chakkarathaazhwar and Arogya Lakshmi Thayar, at their residences or factories, can also contact the Peedam.
. Danvantri homam is performed on all 365 days from 10 a.m. to 12 Noon.
. Sankalpam is done at the time of homam for the related persons and for the global welfare for a disease- and disorder-free life.
. Timings and days of the poojas are subject to changes.
. For participating in the above poojas and special homams, please contact the Peedam for charges as applicable.
. Payment can be made by way of cash/Demand Draft/money order (or) can be remitted in Savings Bank a/c No. 10917462439 with State Bank of India, Walajapet Branch (Tamil Nadu), Branch Code 0775 IFSC: SBIN0000775 in favour of Sri Muralidhara Swamigal.
. Non-Resident Indians have to contact the Peedam to participate in the above homams. 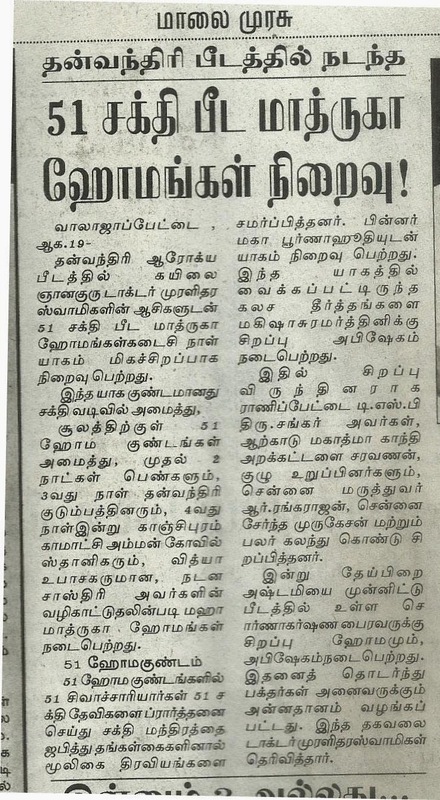 Thanks to DIna Malar 31.8.2014. 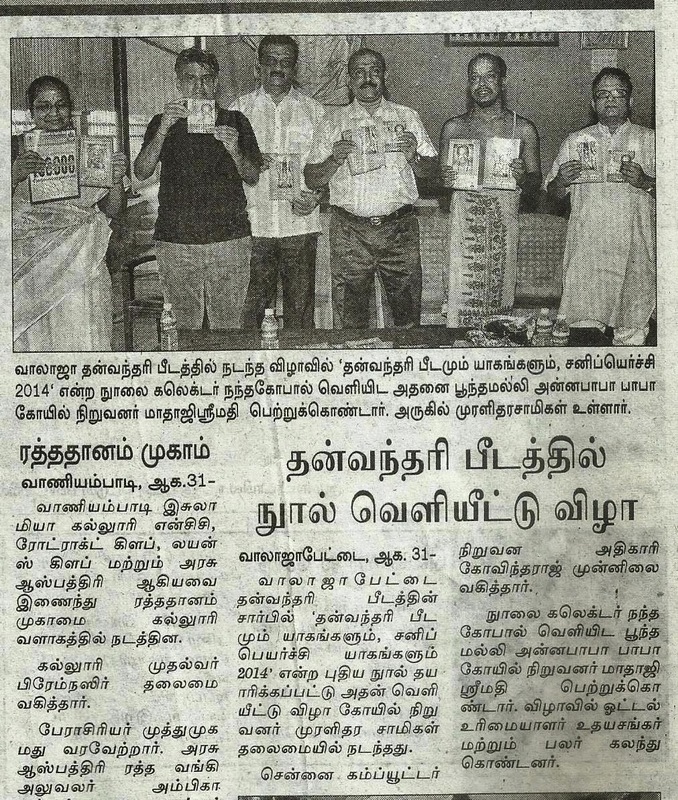 Vellore district collector Nandagopal participated in the Mupperum Vizha of Sri Danvantri Arogya Peedam, Walajapet, on August 29 -- the three functions were Ganesh Chathurthi celebration, release of two books Danvantri Peedamum, YaagangaLum, and Sanipeyarchi YaagangaLum PalangaLum 2014, and the Mangala Arathi of the six-foot Prathyankara Devi idol that has been taken round in karikolam by the Peedam. The Collector participated in the special archana and homam for Sri Vinayagar and offered worship at the Peedam. 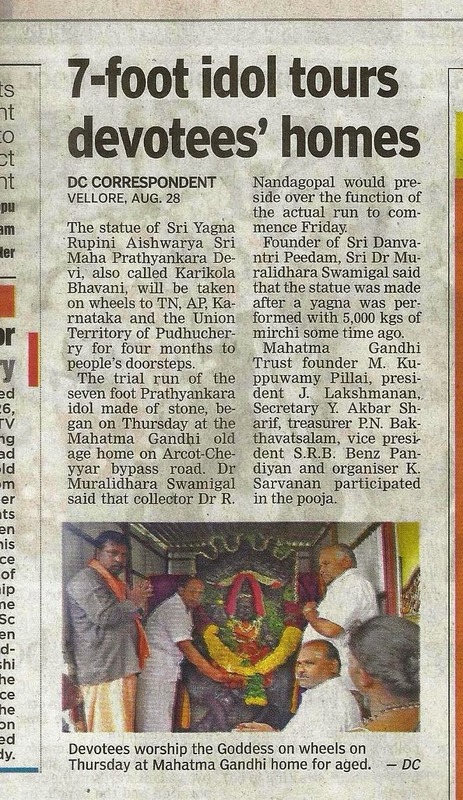 Peedam founder Kayilai Gnanaguru Dr Sri Muralidhara Swamigal received the Collector and participated in the three functions. 23 leaves were used in a special archanai as part of the Vinayaga Chathurthi homam at the Peedam. The special four-foot Vinayaga deity at the Peedam is made of a single stone and is a rare idol. 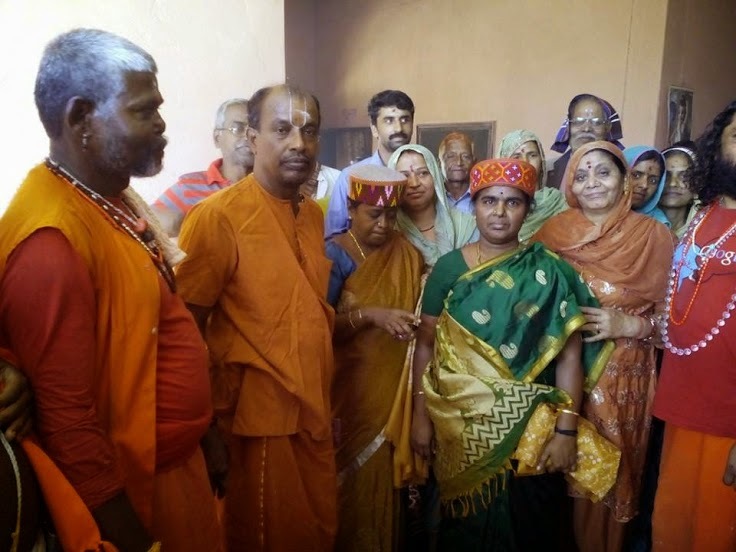 On August 29, a special homam was conducted at the Peedam to rid people of suffering due to effects of karma, and to achieve success in their activities, Sri Muralidhara Swamigal said. The Collector also released the above-mentioned books, copies of which were received by Vellore industrialist and Durga Bhavan hotel owner Udhayashankar, two executives of Polaris computer firm, C Govindaraj and Pradip Nivetha. 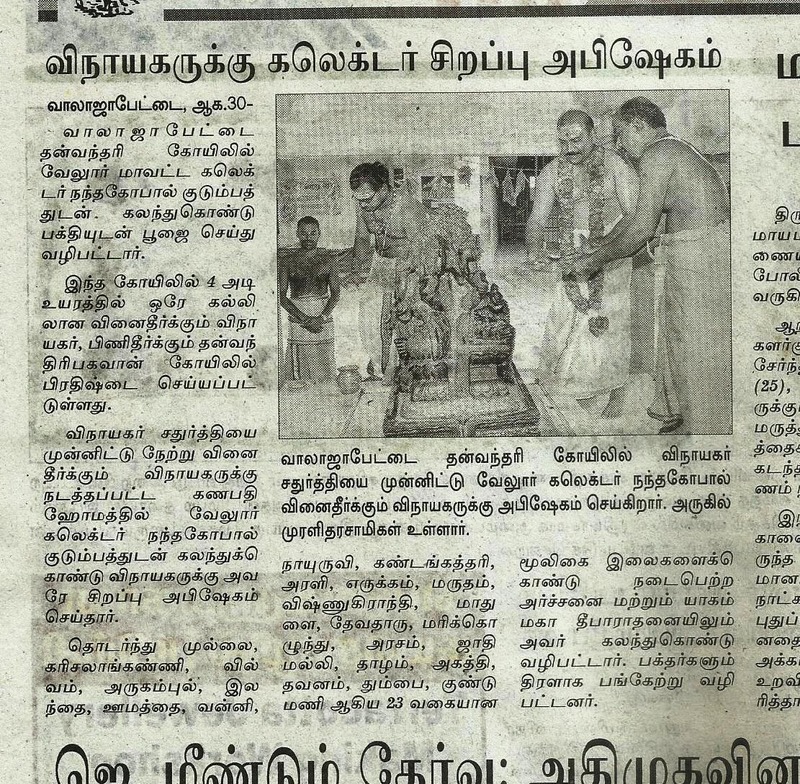 Maatha Srimathy of Annababa temple, Poonamallee, also participated in the functions. A Mangala Arathi was conducted for the conclusion of the karikolam of the Prathyankara Devi idol to be installed later at the Peedam. Later, the devotees took part in the annadhanam at the Peedam. 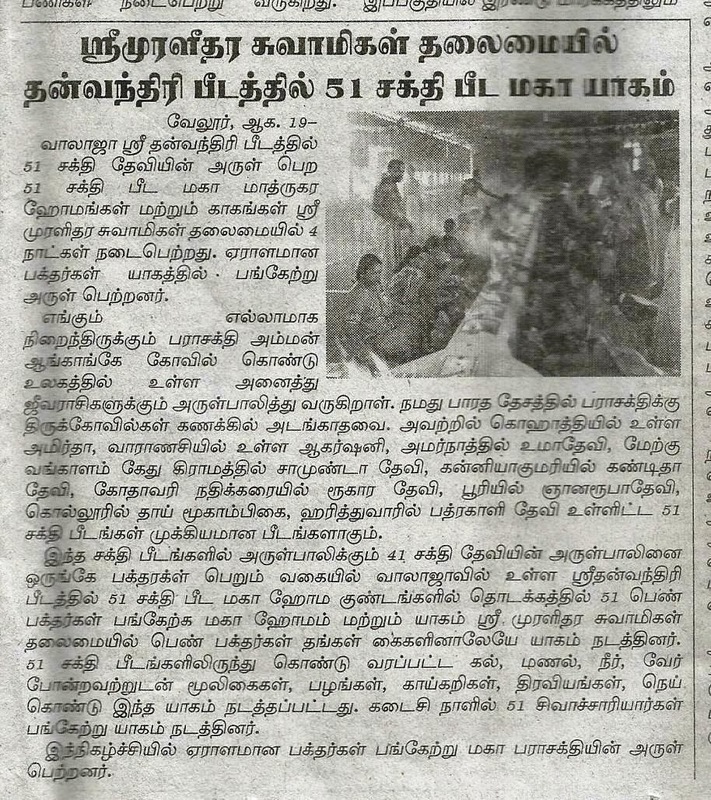 தன்வந்திரி பீடத்தில் மாவட்டயாட்சியர் தலைமையில் முப்பெரும்விழா. தன்வந்திரி பீடத்தில் இன்று விநாயக சதுர்த்தியை முன்னிட்டு தன்வந்திரி விநாயகருக்கு சிறப்பு அர்ச்சனையும், சிறப்பு ஹோமமும் நடைபெற்றது, இதில் வேலூர் மாவட்டயாட்சியர் டாக்டர். நந்தகோபால் அவர்கள் கலந்துகொண்டு வழிபாடு செய்தார், இதனை தொடர்ந்து தன்வந்திரி பீடத்தின் சார்பாக, தன்வந்திரிபீடமும்-,யாகங்களும்-- சனிப்பெயர்ச்சி யாகங்களும் பலன்களும் 2014 ஆகிய இரண்டு நூல்களை மாவட்டயாட்சியர் வெளியிட வேலூர் தொழிலதிபரும்,துர்காபவன் ஹோட்டல் உரிமையாளர் திரு, உதயசங்கர் அவர்களும், சென்னை பொலாரிஷ் கம்ப்யூட்டர் நிறுவனத்தின் அதிகாரிகளான, திரு,சி,கோவிந்தராஜ் மற்றும், பிரதிப்நிவேதா, அவர்கள் பெற்றுக் கொண்டனர்,இவர்களுடன் சென்னை பூந்தமல்லி அன்னபாபா ஆலய நிறுவனர் மாதாஜி, ஸ்ரீமதி அவர்களும் கலந்து கொண்டனர். 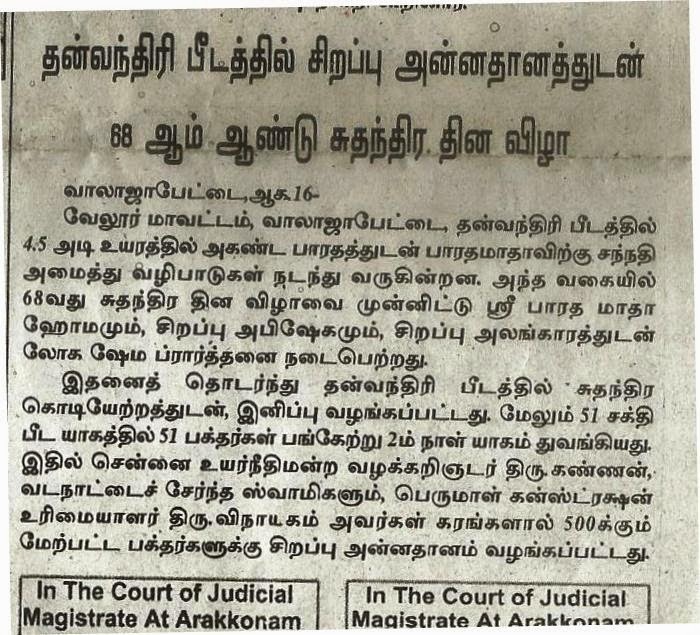 இறுதியாக கரிக்கோல பவனியில் உள்ள 6 அடி உயர ப்ரத்யங்கரா தேவிக்கு மங்கள ஆர்த்தி எடுத்து நிறைவு செய்யப்பட்டது தொடர்ந்து அன்னதானம் நடைபெற்றது, இதில் ஏராளமான பக்தர்கள் பங்கேற்றனர் என்று கயிலை ஞானகுரு டாக்டர் முரளிதர சுவாமிகள் தெரிவித்தார். The homam will be held at 10 a.m. on Sunday, August 31. Homams are Poojas performed for a particular deity by invoking Agni - the God of fire. Each human performed strictly according to scriptures. These are conducted by fully learned and experienced vedic scholars. Enables one to experience oneness with divinity as we unconsciously offer the self through our material offerings. Pooja establishes a bridge between the worshipper (the lover) and the deity (the loved). It facilitates flow of love-energy in both ways. This energy not only sanctifies the self but also re-vitalises the body's resources, making one experience, what is called HOLY BLISS. Thus both the worshipped and the worshipper benefit from Pooja. You have noticed that your life has had many problems since you have moved residence, decorated and renovated. You want to place yourself in the most advantageous position to gain a winning edge. To make up from losses. To shine your destiny & to over come non auspicious surroundings (Home). Gita, a part of Maha Bharata, is considered essence of all philosophies. Having been told itself from the Divine mouth of Lord Krishna, its benefits, especially spiritual and divine, cannot be told in a single paragraph and the same can be only felt by the Yajman (the person, who sponsors the Havan). Bhagavad Gita Yagam is performed to get the essence of Bhagavad Gita. Bhagavad Gita Yagna is an offering to fire accompanied by the reciting of the verses from the Bhagavad Gita. The Gita as given by the supreme Lord Sri Krishna representing supreme Narayana to Arjuna as Nara encompasses the real meaning of all the Upanishads. It demonstrates and explains all aspects of the good human life and all paths to Moksha. Literal pathway such as the Purushasukta and the Gita are extremely suited for recitation in a dedicated performance of Bhagavad Gita Homam. Homam Bhagavad Gita is mainly suitable for performing on Gita Jayanti that marks the day on which the Godly message of the Srimad Bhagavad Gita was delivered. · For fulfillment of wishes. · To get prosperity and peace. · To demolish Bad effects. · To strengthen weak planets. · To discipline mind, silence of mind. · For promptness in action and result. · For help to get fame and name. · For getting wealth and achievement in life. Gita Homam is an oblation to Agni accompanied by the chanting of the verses from the Bhagavad Gita. The Gita as imparted by the supreme Lord Krishna representing Narayana to Arjuna as Nara embodies the essence of all the Upanishads. It sets out and summarises all aspects of the good life and all paths to salvation. 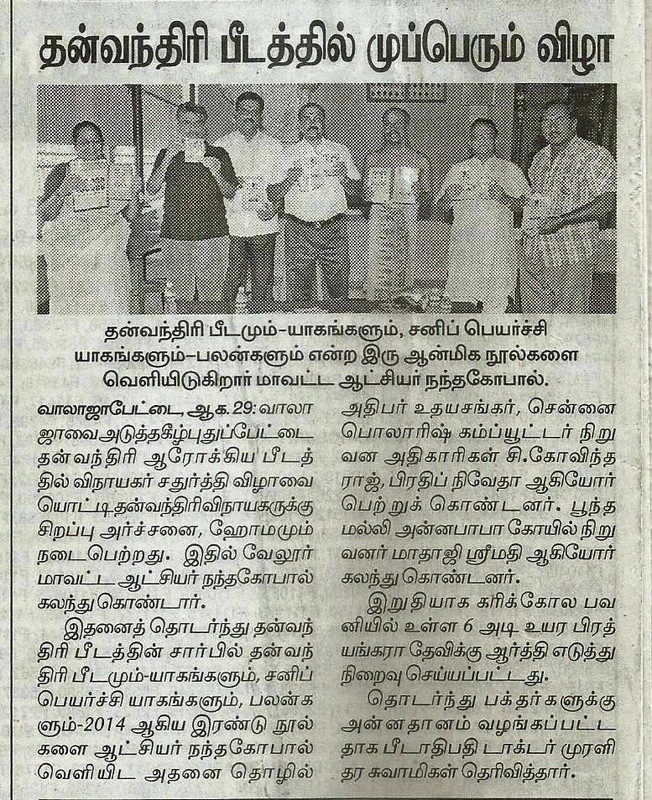 Thanks To Vellore kural August 16-31, 2014. 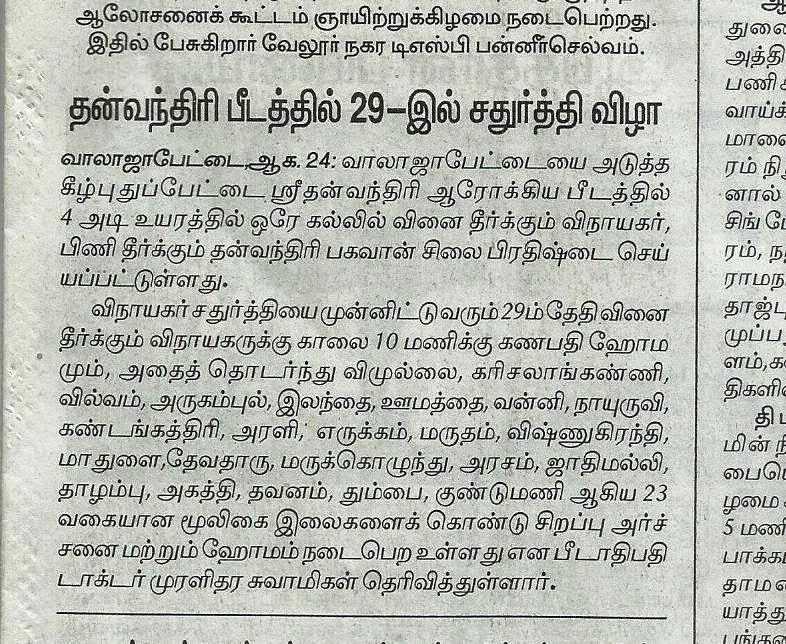 23 leaves would be used in a special archanai as part of the Vinayaga Chathurthi homam at Sri Danvantri Arogya Peedam, Walajapet, on August 29, 2014, Peedam founder Kayilai Gnanaguru Dr Sri Muralidhara Swamigal has announced. 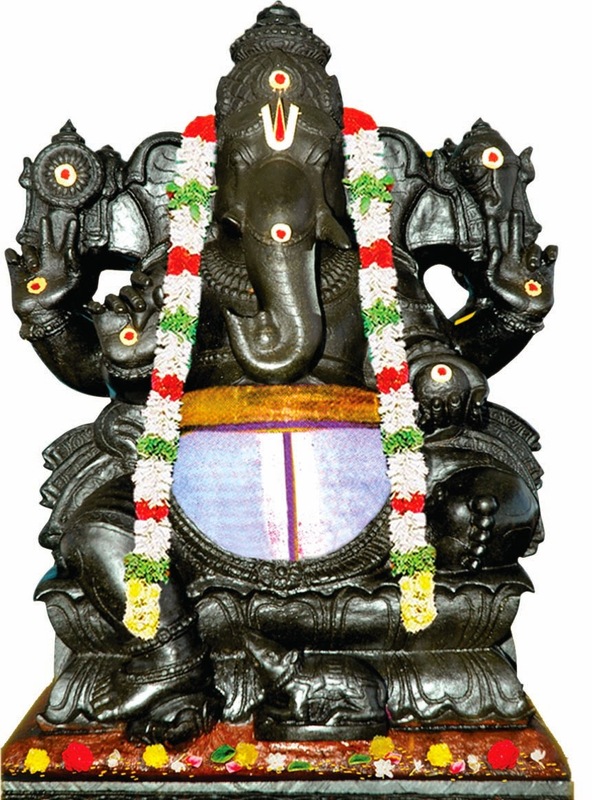 The special four-foot Vinayaga deity at the Peedam is made of a single stone and is a rare idol. On August 29, a special homam would be conducted at the Peedam to rid people of suffering due to effects of karma, and to achieve success in their activities. 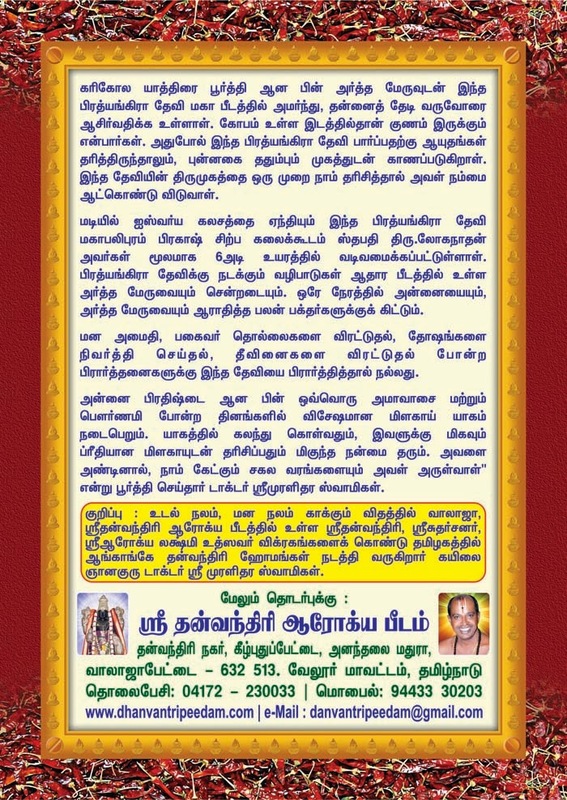 Sri Danvantri Arogya Peedam is performing Danvantri ayush homam, along with Sudharsanar homam and Arogya Lakshmi Thayar homam at SM Silks, Kavarai Street, Muthialpet, Kanchipuram, on August 25, 2014, Peedam founder Kayilai Gnanaguru Dr Sri Muralidhara Swamigal has informed. The homam will take place from 10 a.m to 1 p.m. on Monday, August 25 at SM Silks, Kavarai Street, Muthialpet, Kanchipuram, to be conducted by Sri Danvantri Arogya Peedam, Walajapet, in the presence of SM Silks chairman, Thiru S Manokaran. For more details, kindly contact 9443330203. Lucky are those who can make a trip to Walajapet, in Vellore district, to worship at the beautiful shrine of the God of Medicine, Sri Danvantri Bhagwan. For those who are ill, who cannot afford to go all the way to Vellore, or those who are too old to stir out, Sri Danvantri Arogya Peedam is giving a golden opportunity by getting the ‘Doctor’ to make a ‘house visit’. Yes, that used to be the old-fashioned way when doctors called on patients at home and Peedam founder, Kayilai Gnanaguru Dr Sri Muralidhara Swamigal is reviving the trend. Only, this time it is the God of Medicine Himself who will be making the house visit. 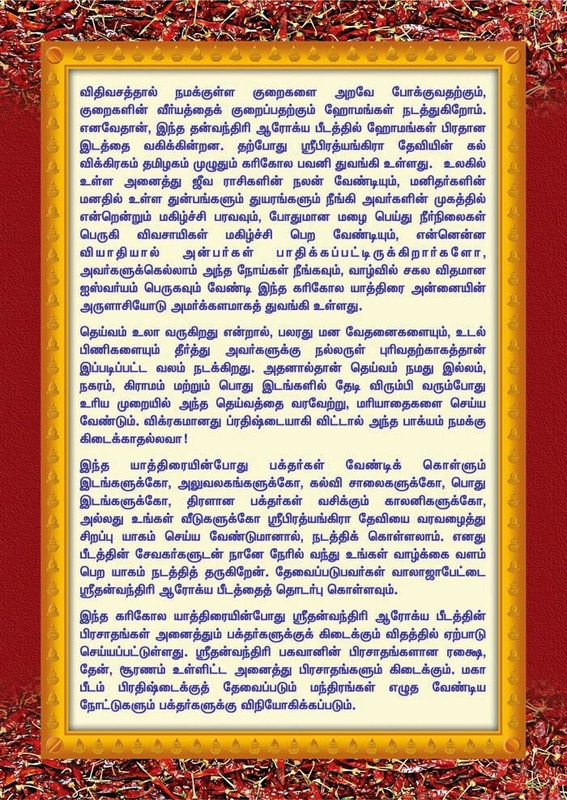 Sri Muralidhara Swamigal says that he established the unique Peedam dedicated to Sri Danvantri Bhagwan, who was the medicine man for Sri Mahavishnu Himself. The Swamigal had made a promise to his dying mother that he would do something in her memory and at the same time ensure a world free of disease and tribulations. The fruit of that promise is the Sri Danvantri Arogya Peedam at Ananthalai Madhura, Walajapet. 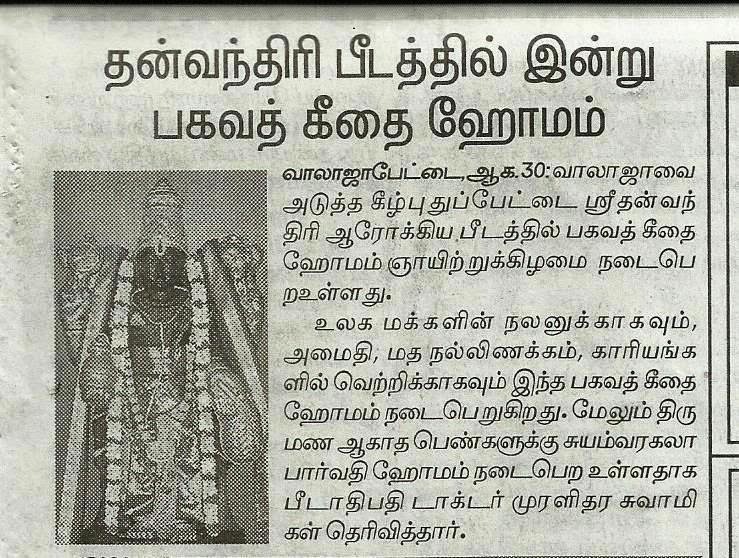 But the Swamigal has added several deities to the divine congregation at the Peedam. There are 70 shrines and deities! What is even more amazing is that he has consecrated 468 Siddha purushas in the form of 468 Siva Lingams in the Peedam! 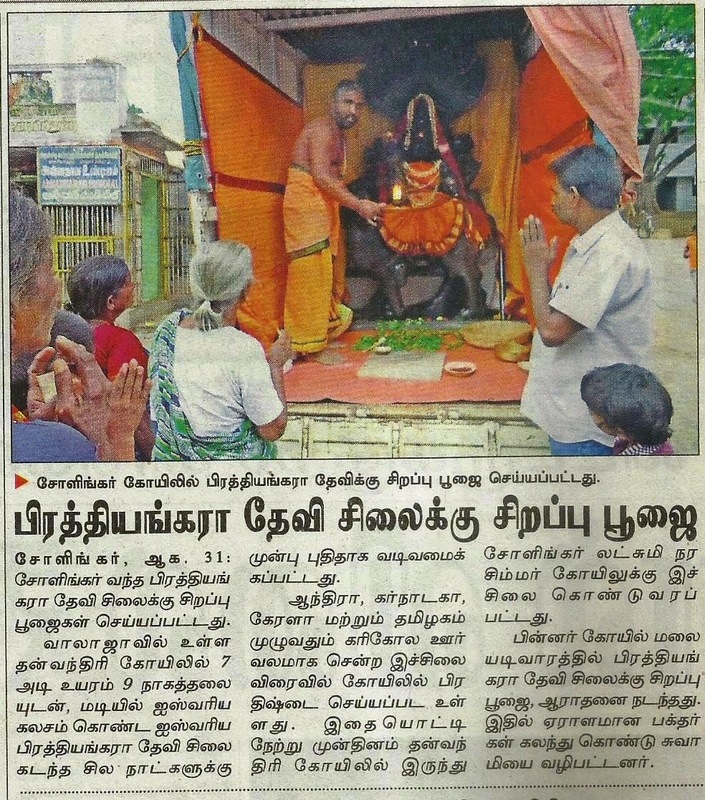 Hitting upon the idea of spreading good health even to people who are unable to visit the Peedam at Walajapet, the Swamigal is now arranging for the utsavamurthy (processional deity), representing the main deity of Sri Danvantri Bhagwan, to be worshipped at your home. It goes like this: The utsavamurthy of Sri Danvantri Bhagwan, Sri Arogya Lakshmi Thayar and Sri Sudarsanar will be brought to the house of the devotee who wishes to perform the poojas. A group of scholars will accompany the deities and perform a set of homams. These include Sri Ganapathy homam to clear obstacles in anything that we do, Sri Sudarsana homam for success in all ventures, Sri Danvantri homam for good health, Sri Lakshmi Hayagreevar homam for students to shine in their studies. Not only that, if the devotee wishes for a special homam – other than these standard homams – s/he can convey a wish for a particular homam to be performed and it would be performed at his/her residence along with these other homams. The whole pooja would last about three hours and include japam and homam and is bound to turn around your life, says the Swamigal. “Many devotees have been inviting Sri Danvantri Bhagwan to their houses to perform this yagam and are reaping the benefits. The joy of the Bhagwan coming home to be part of your household for a few hours is an indescribable experience. So, it is not surprising that people in other parts of the country are also wondering if they would get a chance to play host to the Lord. All I can say is that if you are blessed to host Sri Danvantri Bhagwan, it will certainly happen,” concludes Sri Muralidhara Swamigal. TIME: 10 a.m to 1 p.m.
Walajapet, Vellore district – 632513. Bhagavad Gita Homam On 31st August 2014 By 10 am. At Danvantri Peedam, Waljapet, Vellore Dt.Tamil Nadu, India . It facilitates flow of love-energy in both ways. This energy not only sanctifies the self but also re-vitalizes the body's resources, making one experience, what is called HOLY BLISS. Thus both the worshipped and the worshipper benefit from Pooja. 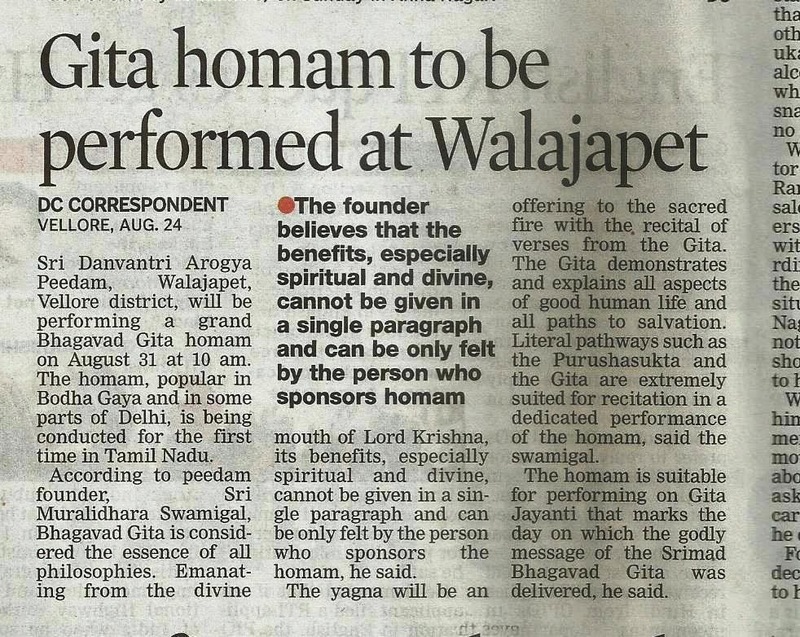 Gita, a part of Maha Bharata, is considered essence of all philosophies. 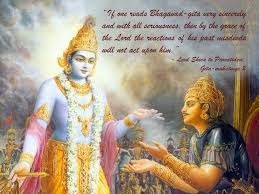 Having been told itself from the Divine mouth of Lord Krishna, its benefits, especially spiritual and divine, cannot be told in a single paragraph and the same can be only felt by the Yajman (the person, who sponsors the Havan).Bhagavad Gita Yagam is performed to get the essence of Bhagavad Gita. Homam for Bhagwad Gita also releases one from the cycle of birth, morality and reincarnation and helps one into ultimate liberation (Moksha). The Sri Danvantri Arogya Peedam strongly recommends Bhagavad Gita Puja And Homam after the death of your beloved ones, so that their souls take rest in ultimate peace. Gita Homam is an oblation to Agni accompanied by the chanting of the verses from the Bhagavad Gita. The Gita as imparted by the supreme Lord Krishna representing Narayana to Arjuna as Nara embodies the essence of all the Upanishads. It sets out and summarizes all aspects of the good life and all paths to salvation. Sri Danvantri Arogya Peedam is performing Danvantri ayush homam, along with Sudharsanar homam and Arogya Lakshmi Thayar homam at Little Oxford Matriculation Higher Sec. 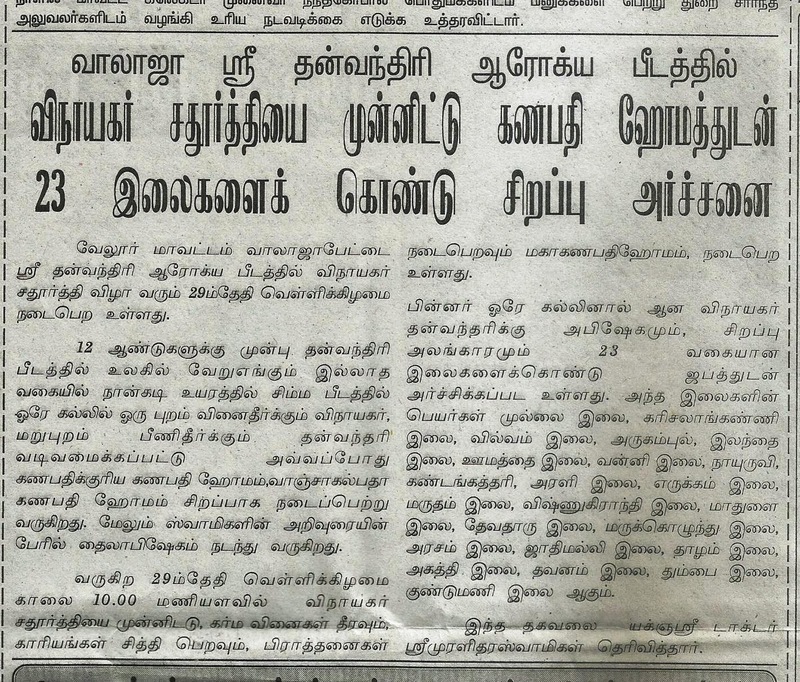 School, Ramanujam Street, T. Nagar,Chennai-17 on August 24, 2014, Peedam founder Kayilai Gnanaguru Dr Sri Muralidhara Swamigal has informed. The homam will take place from10.30 a.m to 1 p.m. on Sunday, August 24 at the school, (48/2, Ramanujam Street) to be conducted by Sri Danvantri Arogya Peedam, Walajapet. For more details, kindly contact 9443330203, 9444138155 (Thiru K Krishnan) and Thirumathi Radhakrishnan (7667406400). TIME: 10.30 a.m to 1 p.m.
திருச்சி சத்திரம் பேருந்து நிலையம் ரவி மினிஹாலில் ஸ்ரீதன்வந்திரி ஆரோக்ய பீடம் ஸ்ரீமுரளீதரஸ்வாமிகள் சார்பாக யாகம் நடைபெற்றது. வேலுார் மாவட்டம் வாலாஜாபேட்டை ஸ்ரீ தன்வந்திரி ஆரோக்ய பீடத்தில் விநாயகர் சதூர்த்தி விழா வரும் 29ம்தேதி வெள்ளிக்கிழமை நடைபெற உள்ளது. 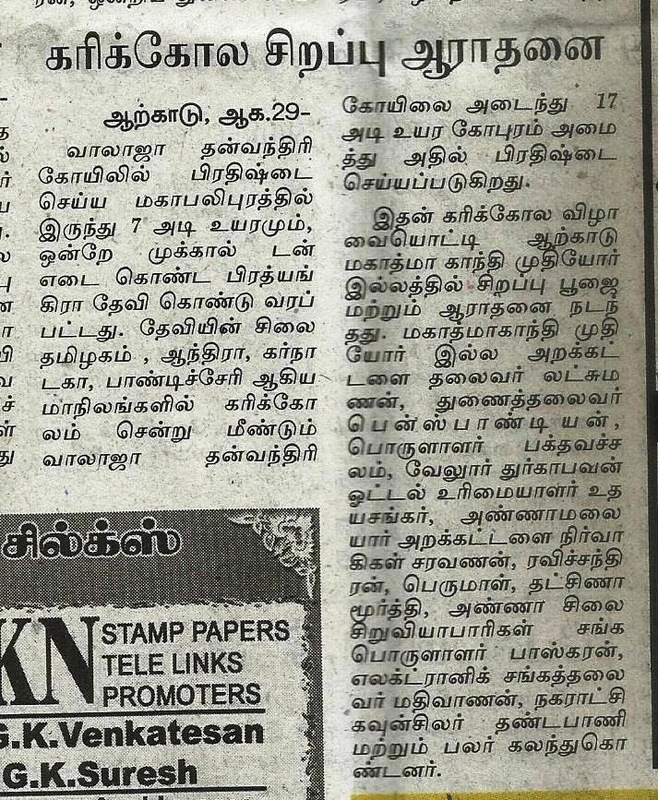 12 ஆண்டுகளுக்கு முன்பு தன்வந்திரி பீடத்தில் உலகில் வேறுங்கும் இல்லாத வகையில் நான்கடி உயரத்தில் சிம்ம பீடத்தில் ஓரே கல்லில் ஓரு புறம் வினைதீர்க்கும் விநாயகர், மறுபுறம் பீணிதீர்க்கும் தன்வந்தரி வடிவமைக்கப்பட்டு அவ்வப்போது கணபதிக்குரிய கணபதி ஹோமம்,வாஞ்சாகல்பதா கணபதி ஹோமம் சிறப்பாக நடைப்பெற்று வருகிறது. மேலும் ஸ்வாமிகளின் அறிவுரையின் பேரில் தைலாபிஷேகம் நடந்து வருகிறது. 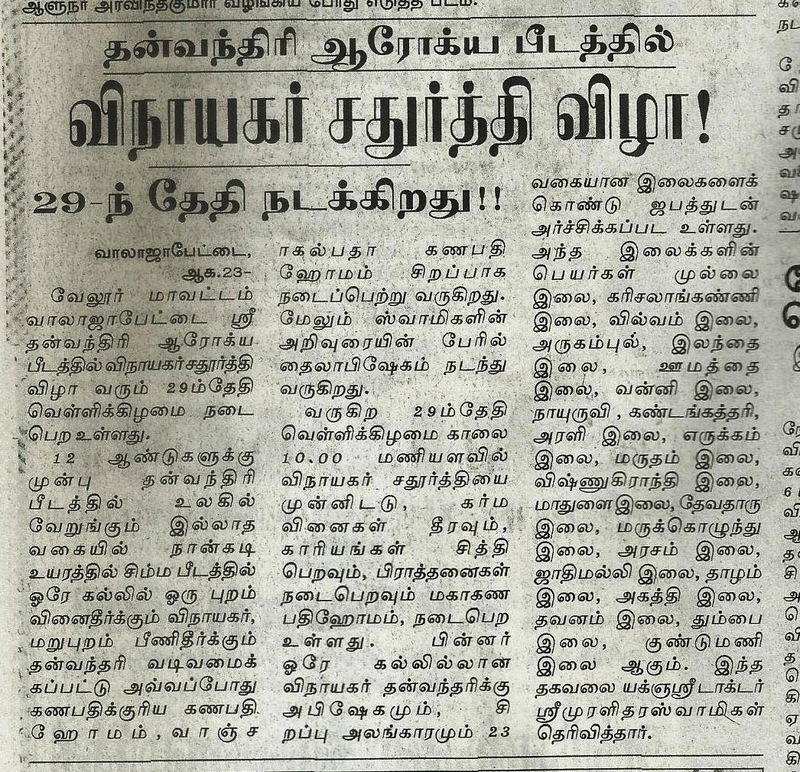 வருகிற 29ம்தேதி வெள்ளிக்கிழமை காலை 10.00 மணியளவில் விநாயகர் சதூர்த்தியை முன்னிடடு, கர்ம வினைகள் தீரவும், காரியங்கள் சித்தி பெறவும், பிராத்தனைகள் நடைபெறவும் மகாகணபதிஹோமம், நடைபெற உள்ளது. பின்னர் ஓரே கல்லில்லான விநாயகர் தன்வந்தரிக்கு அபிஷேகமும், சிறப்பு அலங்காரமும் 23 வகையான இலைகளைக்கொண்டு ஜபத்துடன் அர்ச்சிக்கப்பட உள்ளது. அந்த இலைக்களின் பெயர்கள் முல்லை இலை, கரிசலாங்கண்ணி இலை, வில்வம் இலை, அருகம்புல், இலந்தை இலை, ஊமத்தை இலை, வன்னி இலை, நாயுருவி , கண்டங்கத்தரி, அரளி இலை, எருக்கம் இலை, மருதம் இலை, விஷ்ணுகிராந்தி இலை, மாதுளை இலை, தேவதாரு இலை, மருக்கொழுந்து இலை, அரசம் இலை, ஜாதிமல்லி இலை, தாழம் இலை, அகத்தி இலை, தவனம் இலை, தும்பை இலை, குண்டுமணி இலை ஆகும். இந்த தகவலை யக்ஞஸ்ரீ டாக்டர் ஸ்ரீமுரளிதரஸ்வாமிகள் தெரிவித்தார். 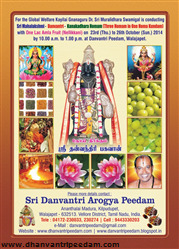 Sri Danvantri Arogya Peedam, Walajapet, is organising a Mahalakshmi-Danvantri-Kanakadhara homam (three homam in one homa kundam) with one lakh Amla fruits from October 23-26, 2014 for global welfare. This programme is being undertaken in view of 55th birth anniversary of Peedam founder Kayilai Gnanaguru Dr Sri Muralidhara Swamigal. Those who participate in the Mahalakshmi homam at the Danvantri Peedam on October 24, will derive benefits like prosperity, peace of mind, and to overcome problems like debts, financial crisis and ill-health. Since Mahalakshmi is positioned in the Danvantri Peedam as Arogya Lakshmi, She would confer benefits like saving one from mental and physical illnesses, provide affection and peace of mind, says Peedam founder Kayilai Gnanaguru Dr Sri Muralidhara Swamigal. 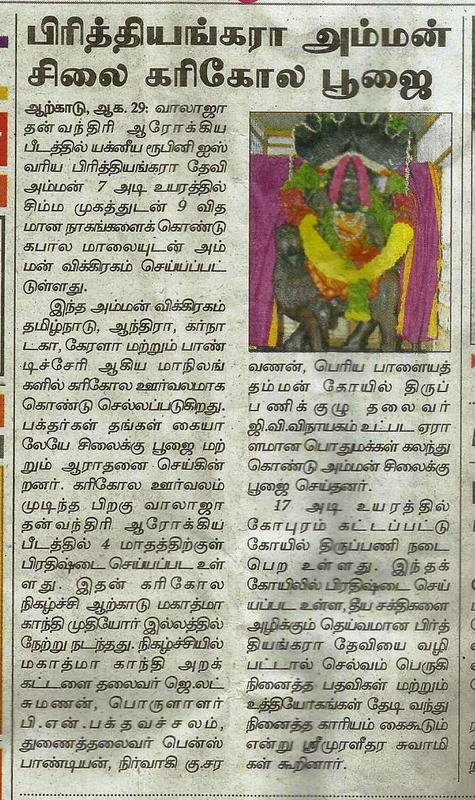 Participation in the homam to priopitiate Sri Danvantri will help overcome illnesses like BP, headache, TB, pain, spondylitis, cough and so on, says Swamigal. Hundreds of herbs would be used in the homam which would in effect be a pain reliever. When one thinks of Amla (Nellikani), the story of Adi Sankarar and the gold rain at the house of a poor woman comes to mind. According to the Adi Sankarar story in Kaaladi, as he studied in a gurukula system, he had to resort to Bikshai (begging for food). One day, he went to the house of a poor woman and recited the words 'Bhavathi Bikshaam Daehi', the woman came out of the and spotted the kid but had no food to give him. All she had was an Amla which she had wanted to eat but gave it to the kid. Adi Sankarar was moved by her kindness and decided to invoke the blessings of Mahalakshmi and recited the Kanakadhaaraa stothram to end her poverty. Immediately Goddess Mahalakshmi created a rain of golden Amlas in the woman's house.That day came to be known as Akshaya Trithiya. Even today, the practice of devotees going to Kaaladi and visiting the house where the Amla rain took place continues. The idol of Lord Krishna is given an abhishekam of golden Amlas, and the Kanakadhaaraa slokam is recited. The Amla is thus an important fruit -- it provides longevity and evokes a feeling of spirituality in every mind. That is why the kanakadhaaraa slokam would be recited during October 23 to 26 for the sake of the devotees. The Amla also finds place in literature. Once Avvaiyar was given an Amla which would give her eternal life. However, she decided to give it to King Adiyaman, saying if she ate the fruit, it would benefit only her but if he ate the fruit it would be better as the service-minded king could help all the citizens. When she handed him the fruit to the king, he returned it to her saying he could help only the citizens, but she could help the Tamil language. Thus the Amla fruit can provide the people prosperity and a lot of good things, said Sri Muralidhara Swamigal. That is why, one lakh fruits would be used in the yaagam so as to benefot entire mankind, he added. Swamigal urged devotees to turn up in large numbers and derive the benefits of the yaagam. 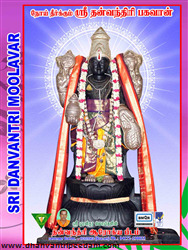 Danvantri homam is performed on all 365 days from 10 a.m. to 12 Noon. Sankalpam is done at the time of homam for the related persons and for the global welfare for a disease- and disorder-free life. Donations can be made by way of cash/Demand Draft/money order (or) can be remitted in Savings Bank a/c No. 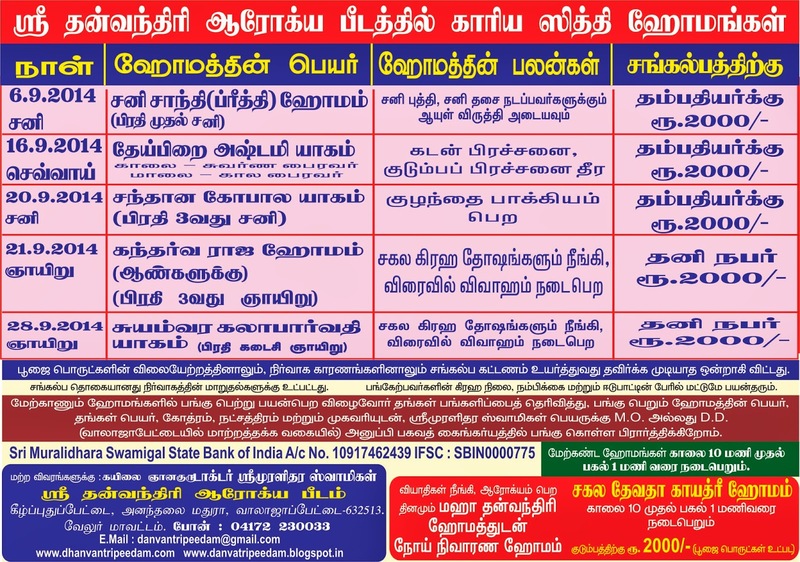 10917462439 with State Bank of India, Walajapet Branch (Tamil Nadu), Branch Code 0775 IFSC: SBIN0000775 in favour of Sri Muralidhara Swamigal. சோளிங்கர் எம்.எல்.ஏ திரு.P.R.மனோகர் அவர்கள் தன்வந்திரி பீடத்தில் தரிசனம் செய்தார். 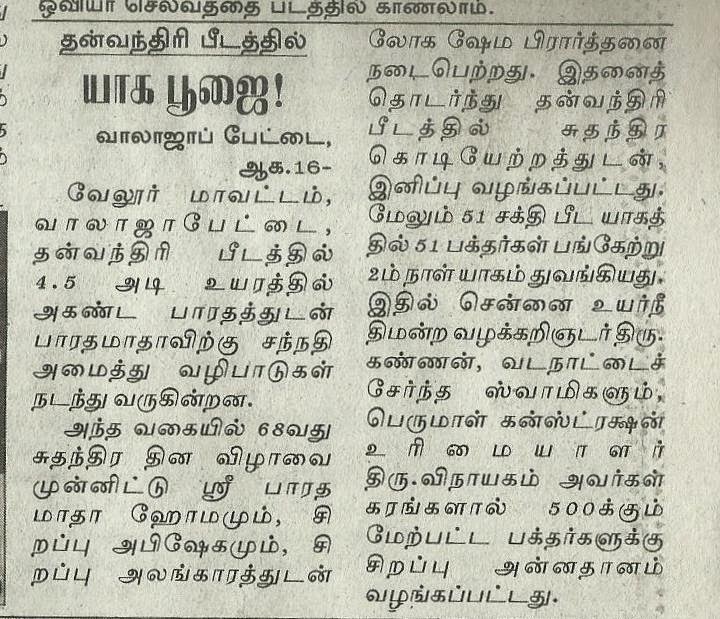 Thanks to Vellore Kural August 01-15, 2014. Thanks to Deccan Chronicle 02.08.2014.